Another fun one! Happy Holidays everyone! Would love Santa Mouse to visit our house! I LIKE and love Totally Target on facebook! Love this site and all the give-aways! I love your site. So fun to go and hunt down these deals at Target. cannot wait to go to target! Thanks for the chance to win some Target moola! I’m keeping my fingers crossed!!! Thanks for all you do on your website that helps me save money. How fun! Thanx for all your hard work! Merry Christmas! I already “like” you on the facebook! I like and Luv totally Target, Thanks for all you do!! Wow this is a great rise! 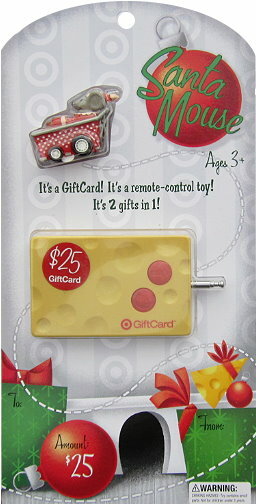 To would be great to win such a cute card to my favorite store!! I love following you on facebook! !